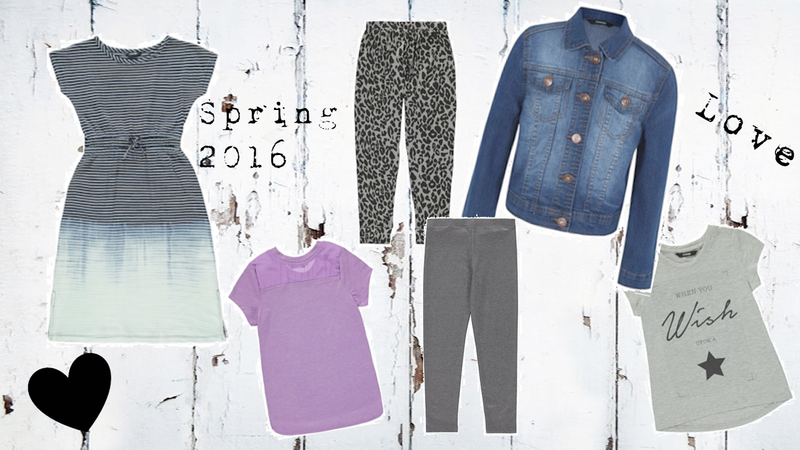 Fashion | Spring Fashion Essentials for Girls from George @ Asda. George @ Asda is fast becoming one of my favourite one-stop shops when buying kid's clothes. I love how I can browse at home, order online and collect it the next day at a store really close to my home. I find the prices great and think the range is really trendy for a soon-to-be 10 year old. I find myself doing a bit of a haul for Lauren in Autumn and Spring. We sit together to pick stuff out and have a good think about what will go with what. Nothing worse than a wardrobe full of clothes, but you can't match pieces together to make an outfit. We also like to shop at Next, H & M and Primark too. Everything pictured above is for age 11-12 and the prices quoted reflect that. First up is the gorgeous dress in shades of blue. This is £11.00 and would look great with a pair of Converse and the denim coat. Next, is the Lilac T-Shirt. This is just £4.00 and is photographed to show the back with the net detailing. Would look great with a pair of skinny jeans and ballet pumps or converse again. Along from this there are two pairs of trousers. The Leopard print pair are harem style and again would go well with the denim coat and a little vest top. The other pair are foil type leggings in shiny grey/brown. I was a bit dubious about these, because Lauren says everything itches, but the reviews on the website say that they are really soft and lovely to wear. The harems are £8.00 and the leggings £6.00. Up in the top corner is the denim coat. We have already ordered this at the bargain promotional price of £5.00 - should be £11.00. Unfortunately, it is tight on the arms, so will need to be exchanged for the next size up. Lauren had one of these coats, last year, and wore it to death. It went with so many things. And last, but not least, in the bottom corner, is the lovely grey T-Shirt that would go with the leggings or skinny Jeans depending on the length. I don't like VPL in leggings and think it looks just as bad, if not worse, with children's clothing, so won't mix leggings with a T-shirt unless it is quite long. This is £6.00. Lauren and I are looking forward to buying this little lot over the coming weeks. We just need some lovely Spring weather to wear it all now. Where do you like to buy Girl's clothing from?